The night before I went to the hospital to have this little nugget, in one last burst of frenetic nesting — a tornado of focused, effective energy I sorely miss in these early months — I decided to do something so practical, I’m still patting myself on the back for it: I made a big volume of lazy baked ziti and divide it into three dishes, two that went into the freezer. I have not been this productive or effective since. But enough about the practicality, the texture, the greens and all the feels, let’s talk about what really matters: how are the corners? Tell me about the edges! And the answer is: I will not. I do not share them, so don’t even ask. * Psst: Go ahead and buy the big tub because when I had no choice but to, I found a fun way to use the rest, coming up next. A few notes: To make this without meat, as I’m not personally into meat substitutes, I would use a pound or so of sliced mushrooms instead to make this vegetarian. To freeze, you can freeze this unbaked and once defrosted, bake it in the oven as directed. You could also freeze it after baking, and just defrost and rewarm it, but that leads to softer noodles because they get warmed/cooked an extra time. Finally, if you really really like those crispy edges (I do! ), I find if you use a round or oval dish and ziti noodles (with straight ends) vs. penne noodles (which usually have angled ends), it especially leaves jagged edges, more prone to crisping. It also helps to just pour the pasta mix into the dish, not press it into the corners. This looks fantastically tasty and easy, I can’t wait to try it! Speaking of ricotta, do you ever get the full-fat ricotta at Trader Joe’s. I have a sneaking suspicion that it’s TJs-branded Calabro — it’s SO good. Suggestions on making this meat-less? I have been experimenting with lentils as a replacement for ground beef but any thoughts you have are welcome! Might be a bit weird but tonight I made it with ground up carrots in place of the meat! It was delicious. Will definitely make this with ‘fake meat’ aka boca burger crumbles in place of the sausage. Sounds amazing. Looks like one more freezer meal to prep before the baby comes in a couple of weeks (don’t worry, we’ve already got the Dijon beef stew, baked pasta with sausage and broccoli rabe, broccoli cheddar soup, the squash pasta bake, and, for shame, some non-SK meals, in the deep freeze). This looks delicious! I’ll be going meatless, too! Beyond Meat has some frozen imitation ground beef that’s excellent, so I’ll either substitute that or try lentils, as someone mentioned, above. You mention freezing portions, but I’m not certain how to do this. Do you freeze it before or after you cook it? Do you partially cook it? Sorry, I’ve never tried freezing stuff, but if this sounds like a good one to have prepped and frozen for those days when you don’t wanna cook. Without meat — I’m not personally into meat substitutes, but I would use a pound or so of sliced mushrooms instead to make this vegetarian. To freeze — You can freeze this unbaked and once defrosted, bake it in the oven as directed. You could also freeze it first and just defrost and rewarm it, but that leads to softer noodles because they get warmed/cooked an extra time. Yum! I love having dinner ready to go in the freezer. Can you update with specific freezing instructions? Do you freeze before baking, or after? Thaw in the fridge the night before or can it go right from freezer to oven? Bake at 350 for how long? Best tips for freezing? Sorry to pester… I never know the best way to freeze and reheat things! Delicious! And I love that it is freezer friendly, cannot wait to cozy up with this dish. Thanks! This dish is pretty much perfection… I usually use 1 lb gr beef + 1/4 lb sausage.. but my real intention here is to kiss that beautiful baby. You are sooooo lucky! God bless. I often do this very same thing, but with sauteed mushrooms and zucchini for more veg. Its such a great go-to lasagna-ish dish. hi! looks great :) if i want to make it without meat is it ok if i just take it out? do i need to change something? Is it just the shadows from your dark baking dish, or did you not push the noodles all the way to the edges to allow for more crispy bits?! And, if one were theoretically interested in that, would that work?? Looks yummy! However my husband has this thing against cheese. This is quite incredible of course (and even more so because we are Dutch) but I am learning to live with it… Are there maybe any possible cheese substitutions you can recommend? Not only in this dish but for pasta bakes in general? Sarah — I try to not shove it in too much. In fact, if you use a round or oval dish and ziti noodles (with straight ends) vs. penne noodles (which usually have angled ends), it especially leaves jagged edges, more prone to crisping. See the pre-baby version, here. Nicolette — I really like bechamels in baked pastas; it can make up for some of the richness lost by the cheese. Here’s a pasta bake with a bechamel. How did you know I’m feeding my son’s soccer team next week? I’ve been looking for exactly this! 3 batches should feed 15-20 teenage boys, right? Libby, I remember those days! High School soccer team would eat about 75-100 meat balls 4 pounds of pasta about a gallon of sauce and about 8 loaves of garlic bread! Okay, the pasta looks great and all, but omg… that baby! She is SO pretty! Congratulations on making it past the first two months which, for me, were the hardest. After that, I started to feel like a normal human again. I love this so much, I think I’m gonna marry it! Just put this in the oven for an early dinner tonight. Used hot Italian sausage and no spinach as I didn’t have any. Smells wonderful! 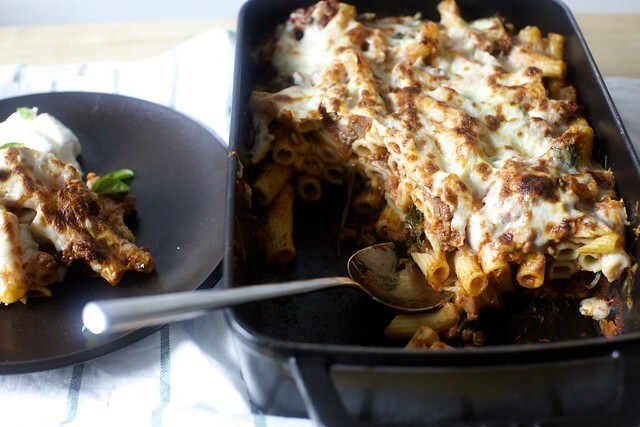 You might really love pastitsio, which is like Greek baked ziti. The beef (often with a combo of lamb, though I omit it because I’m just not a lamb gal) is seasoned with lots of oregano and cinnamon, which sounds like a strange mix until you taste it. Topped with bechamel (and Parmesan if you’re Ina, which we should all be). It freezes beautifully and makes enough to divide into two meals – one for now, one for later. I didn’t get as much done before my little nugget arrived as I would have liked, but I was mighty glad to have that in the freezer in those first sleepless weeks (er…months). I made something like this the other month, without realizing it was close to ziti (which amazingly I seem to have never eaten before). I used fire roasted tomatoes (canned) as part of my sauce, which seemed to boost the flavours. I have a perpetual problem where my sauces lack flavour. Unfortunately, in this instance, the noodles went very soft when frozen. Deb,I a new to freezing. I had 4 kids at home at one point and food was simply eaten. Would I put half of this recipe into the pan I which I would bake it, cover with foil and freeze? Or into a tightly fitting container? I am looking this up, as well, but I wanted to ask you also. Thanks. I love baked ziti and although I do like meat in my ziti the mushroom substitute sounds really good…or meat and mushrooms – yum. I also like to use italian sausage with fennel in my ziti – so good! So, if you are not into cheese, why wouldn’t a ritz cracker topping, such as you use for macaroni and cheese, work nearly as well? 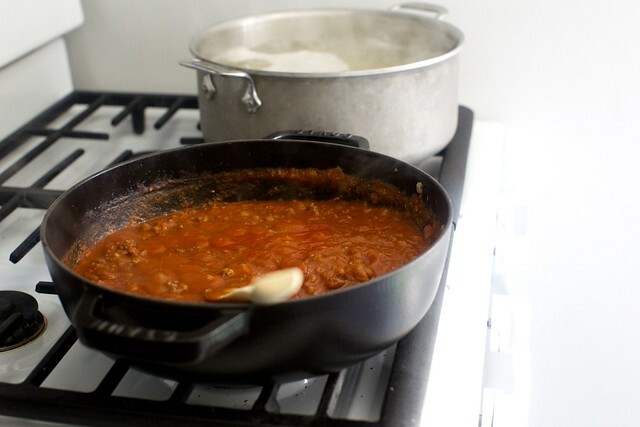 Do you drain the tomatoes before adding them to the pan, or do you include the liquid? Thanks! So the other 3 members of my household don’t like baked ziti (???) but if I swap out the ziti for elbows & call the whole thing goulash they gobble it up. Go figure!! This is perfect timing as I wanted to make it for dinner tonight but realized I have no ricotta in the house for my usual recipe. Can’t wait to try it!!! Thank you for all the dinner inspiration! I am SO impressed that you continue to post so much so soon after giving birth (to such a beautiful girl!!). Made your challah yesterday and have your broccoli soup on tap for this week. Thank you for making the daily grind more interesting!! My mouth is already watering when seeing those pictures. This is going straight to my save list and then on my meal list for the upcoming weekend. Thank you! I think all of the questions about freezing may be because of an error in your freezing directions. You wrote “You can freeze this unbaked and once defrosted, bake it in the oven as directed. You could also freeze it first and just defrost and rewarm it, but that leads to softer noodles because they get warmed/cooked an extra time.” I think the second sentence is supposed to be, You could also bake it first, and just defrost and rewarm it…leading to twice baked noodles. Am I correct? This sounds terrific and I am going to make it to put in the freezer for hubby while I take off to see my baby grandson for a week! Thanks Deb and kiss those two gorgeous kiddos for me!! Just a note on the volume of a 9 x 13 x 2 in. pan–I believe it is 3 quarts, not 4. This looks like all the comforts of home in one warm, crispy, melty casserole. Already excited to try it. I have to say, you and your website are absolutely incredible! My mother in law and I love love all of your recipes. We think you are a wonderful writer, and have a great personality. I feel like I almost forget about baked pasta these days, what with everyone talking so much about the evils of carbs and gluten. It feels like something from a bygone era (I recently watched the Sopranos and was surprised at how much baked ziti they eat and how little any evils of wheat are discussed). And yet I love a good, simple baked pasta like this so much. Thanks for the reminder. This looks perfectly delicious! I’m definitely going to be giving this one a try soon! I love finding a good recipe for classic and delicious meals! Looks delicious and super comforting! I’m due with #4 in two weeks and I think I need this in my freezer! old school rules/new school drools. … and yes, ziti texture is Everything. of course you have game in this area. I’m with you on baked ricotta, the texture is horrible. This pasta bake is similar to something my boyfriend and I used to get at a restaurant and reverse engineered at home. He was insistent they stirred globs of mascarpone into it before baking and even although I know it was mozzarella, I didn’t argue as I’m not keen on the rubbery texture of melted mozzarella either. The mascarpone is lovely however (creme fraiche might work as well? ), if you’re looking for the creaminess of the ricotta inside the dish without the weird texture. I think black lentils would be a great vegetarian modification. They don’t turn to mush and I use them in sauces all the time for meatiness. Just what I wanted– quick, easy, comforting, and delicious. I divided it into two 9″ round pans (one for us and one for a sick friend.) I used ground bison rather than beef, and pureed the tomatoes (I was going for as old-school as possible). Weeknight perfection. You are marvelous. Hi Deb, could you please tell me the same recipe, but for 11×17? Also, could you tell me how to go about converting recipes from 9×13 & 8×8 To 11×17? Thanks Deb! Love those corners too! I hope you are catching a few winks of sleep here and there between keeping us all so happy! You.are.a.genius. So good! Perfect recipe for the fall– loved it, and it works great with a little extra spinach (I used 8oz instead of 4 oz) and slightly less cheese (I didn’t have quite as much as the recipe called for). I added a bit of wine too as I was cooking down the onion/sausage/garlic mixture and that really seemed to add something to the flavor of the sauce. When I make a lasagna I always add pesto to he ricotta to take away the weird chunkiness and give it an extra fresh bite. I was looking for something just like this to make for my husband and son for the week following my chemo treatment next week, when I’m all nauseated and don’t want to even see or smell food. This will be perfect! And if I’m lucky, there will still be some in the freezer when the nausea is over, and then I can enjoy it too! Made it tonight – delicious!! You can do no wrong. I have seriously been craving carbs and pasta for days. I will take the whole pan! Yummy! 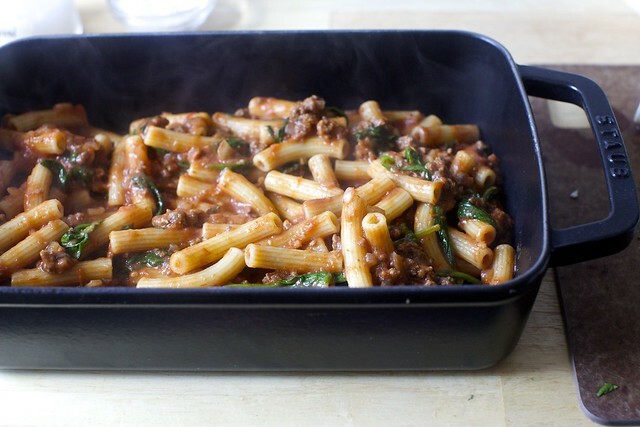 This looks so good, and so easy, and I just bought a box of ziti last week- it must be fate. That delicious little white fluffball in the hat is astonishing too. Those eyelashes! That perfect little peach complexion! A stunner, even with the dazzling hair covered! This received eight thumbs up tonight! I used “fresh” mozzerella (okay, it expired last week!) and Romano, as there wasn’t Parmesan in the house. I probably doubled the spinach to finish up the last of the CSA greens. Wonderful! Have made a similar recipe in quite a few diiferent versions over the last years, but I was never completely happy with the outcome, it was always tasty but not more and for me that’s not enough. So I will definitely try your delicious recipe and I am sure it will be a winner! Your abundance of freezer meals right now is hitting the spot! I’m starting up my second year of grad school (while still working and being the sole cook in the house) and trying to pack my freezer with meals. THANK YOU!!!!! We just made and then finished off two pans of the cheesy, rice and zucchini gratin. So good! Can’t wait to make this next! This looks so comforting and delicious! I’d love to pull something like this out of my freezer. I SO need to get better at that. You’re awesome, Deb! Instead of ricotta, I make a bechemel and spread that between the layers. YUMMY – it makes the casserole so very creamy and delicious. Had this last night….. wonderful !! Funny, we are watching the Sopranos For the first time, this fits in perfectly !! I really enjoy your blog. Thanks! I was wracking my brain trying to sort out what to make for dinner that would please my foodie daughter who loves light vegetarian meals and my processed food loving son who prefers Campbells to my homemade chicken noodle soup. Well, this recipe fit the bill for neither child, and yet they both ate it heartily! Thanks! This looks and sounds absolutely amazing! Love all that cheese on top. Thanks for the tip on freezing it – this would be such a nice go-to, freezer-ready meal. Gotta have the ricotta. It’s too dry without it. But ricotta has to be doctored before you put it in – and I don’t mean just egg but a lot of either milk or cream, so you end up with a ricotta custard, rather than dry clumps of cheese. Make some. It’s easy as sin, too easy. Simmer milk. When it’s is just about to boil, add lemon juice or vinegar, stir very gently so you don’t break up the cheese – strain through cheesecloth. Woot. Recipes all over the internets. SO SO SO DELICIOUS AND ADDICTIVE AND PERFECT AND GOOD FOR LITTLE LEMONY POUND CAKE COOKIES TOO. The cheesy crust on the top of that looks amazing! This looks delicious & easy! In the recipe, you write that the spinach should be sliced into ribbons but it appears that you put the spinach in whole. Do you have a preference? Notice how closely we look at your photos & study your every word!!! The baby, oh the baby. May I come snuggle her? It looks great. Don’t worry about being productive enough. Being with your baby and creating that bond and security is quite productive, just not easily measured. God bless you and your family. Thank you for all the wonderful recipes you share. You are very inspirational. Deb, this baked ziti is just the way it should be– OLD SCHOOL. I’ve been craving all kinds of casseroles lately, and yours is a recipe I can definitely trust. Can’t wait to try it!! Thank you. Old school is always good! Looks amazing! I am pregnant now, and starting to think about packing the freezer, especially since I live in the middle of nowhere, with no takeout options nearby – so jealous of your options! Equipment question: what pans do you use to freeze this in? the ones you show? Or do you freeze it in something else and transfer before baking? Thanks! Made this last night with mushrooms instead of meat. Delicious and super easy! I’ll definitely be making this one again. I made this tonight. It was easy and delicious and I froze half for when my kids are home for holidays. I used swiss chard as that is what i had and it worked great. Can always count on your recipes! Just made this for dinner tonight (your posts so often line up with the day I plan the week’s menu), and it was fantastic and so quick and easy. I did add about an extra ounce of spinach, so I could use up the whole package in one go. Also, 1/4 lb extra mozzarella, also in order to use up the whole package in one go. Was worried that it would be too cheesy, but it was fine! Thank you!! Made this tonight with GF rotini pasta, cooked very al dente as you recommended. It was perfect. And the rotini had a nice crunch on the top. This looks so nice and hearty! Yum! This looks amazing. I always use sausage with ours. Always a great meal. 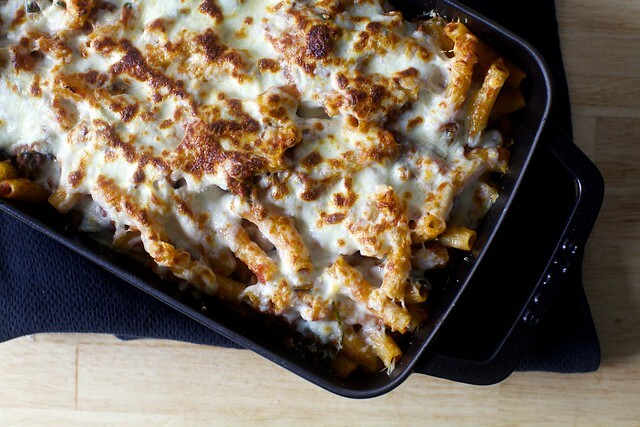 This might seem like a silly question, but what do you put this delicious ziti in when it’s headed for the freezer? Do you really freeze the entire enamel casserole dish? Or do you use foil pans? I always want to freeze dishes like this one, but I don’t have a lot of cookware and I never want to sacrifice a favorite pan to sit in the freezer. Thanks for all you do! To freeze — I use disposable tins. You can use regular dishes, but then they’re out of rotation until you defrost it. Laura — Good point. Larger leaves, I slice into ribbons. Baby spinach, I don’t bother. Julie — You are amazing. Good luck. Ann — For 8×8 and 9×9, you can almost always safely halve a recipe for a 9×13 or quarter-sheet pan. For 11×17, you’ll want to 1.5x a 9×13 recipe. JohnnySeattle — We’re on it! Peg — Yes, thanks, now fixed. Symona — You are correct; now fixed. Hannah — No, the tomatoes are not drained. Made this in a veggie version tonight with diced, sauteed eggplant instead of mushrooms. Winner ! PS : I am in the ricotta fan club…but always add a full head of roasted garlic to the cheese when making a veggie ziti or lasagne. Deb, for the record: you have kept two small humans alive and managed to make cupcakes. I’d say seriously efficient and effective! Beautiful! We are due in a few weeks and trying to stock up the freezer so will add this to the list. Do you have other favorites to recommend for stocking up ahead?? I think every family has the big comfortable dish like this (my family’s was always a big pot full of spaghetti and meatballs! ), so thank you for sharing yours. This seems like a lovely recipe! Any chance you could substitute frozen for fresh spinach? I have a freezer full I am looking to use up. This was delicious. Made it last night after stopping at Whole Foods down the street from my office to pick up baby spinach and ricotta. Made it exactly as written. My husband loved it, and he is a hard one to please. Getting raves from him made my night. I hope my raves for your recipe make your day! Just in time for a visit from the picky branch of the family–you saved me! Do you use good mozzarella, or just the regular part skim, part plastic stuff? I doubled the recipe and used a pound each of ground beef and mild Italian sausage. 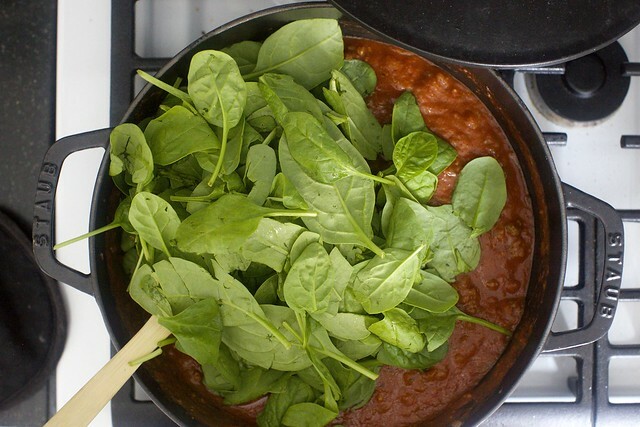 I wouldn’t add any pasta water to the sauce until after you add the spinach, that stuff adds a bunch of water on its own… I might just dunk the spinach in the pasta water, then wring it out before I add it next time. I ended up filling three 9×9’s. So we have an exchange student from Spain staying with us for a month and feeding her has been a very fun challenge. She has been great about trying new things but her palate is different not only from my family’s specifics but even from the general background palate most Americans share. Along comes this recipe, which sounds like something my kids will love, but while our student talks about eating sausage at home she did not care for the Italian sausage I used in dinner one night . I decided it might be forgiving enough to accommodate a different sausage if carefully chosen. I came home with andouille sausage thinking the cajun spices described on the label would work. Ends up it is smoked sausage so it doesn’t crumble when cut open but I cut it into small bite sized pieces and went for it. Both my family and our guest loved it. Thank you Deb for helping me to break out of my shell and use recipes as places to start rather than to end! Great recipe! If you are using just ground beef, then I would add ground fennel to the mix. Megan — I go halfway in-between. I use the fresh stuff that’s dry-packed, i.e. a wrapped ball. I find the wet stuff is better for fresh uses, the water doesn’t lead to a good baked texture. And the Polly-O-ish stuff, well, it’s fine in a pinch but we’re a little spoiled around here and can get decent fresh stuff so it’s not needed. Smum — Frozen spinach will work just fine. I’ve only made baked ziti with egg in it before, so I love that there isn’t one in this recipe. The spinach along with the meatless mushroom version sounds like THE perfect cozy dinner…can’t wait to try your version! Could you clarify the seasonings in ‘italian sausage’ so I can have an idea of what to add to sausage meat in the UK. I would expect rosemary, thyme, oregano…anything else? Thanks. Sarah — Hope this helps. I made this tonight for my in-laws. This is not boring old dry baked ziti! I puréed the tomatoes for the sake of my kids (“Mom, there’re CHUNKS!”) and used local, legendarily-delicious Italian sausage that is teeming with fennel seeds and fresh oregano. I broke a sweat grating all that cheese, but just considered that a reason to eat more ziti later. Although I have never thought about eating ricotta on the side, I trust your judgment and went with it. I felt like I was eating a ziti sundae! Cold, tangy, creamy ricotta contrasted with the hot, zesty ziti–yep. (I also made your cream cheese pounds cake, which I’ve been making for years.) Thank you for helping me be a food goddess. For the future, I’ve found that lentils make an excellent ground beef substitute. Plain old brown lentils are fine, pre-cooked or canned – but if you can find the tiny black lentils they’re absolutely perfect! Two cans drained has substituted evenly for a little over a lb of ground beef in all my recipes (since I married a vegan). Oooh this looks yummy. Any ideas if I want to leave out the cheese? Orthodox Jewish girl here…. Amazing. 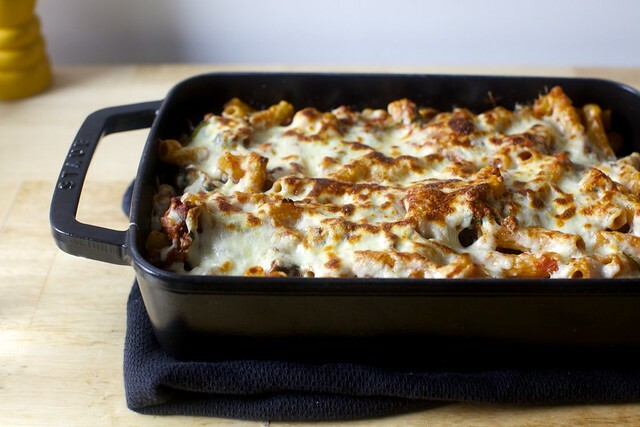 This is the baked ziti that finally made my family love baked ziti as much as I do! Deb, another home run recipe! I doubled this for a crowd of 12 at a vacation home this weekend, and it was a perfect make-ahead meal along with a green salad and garlic bread. I did manage to complicate it a bit by mixing in about 2 cups of bechamel sauce with Parmesan–my mom’s baked pasta recipe uses two sauces, tomato and bechamel, and it’s a bit richer. I agree with your approach, baking it without the ricotta, as it gets grainy instead of creamy. I would definitely follow your recipe just making it at home for a weeknight. Thanks for bringing “old school” baked ziti back into my orbit! My husband and I fully endorse and support this recipe. Although I admittedly burned my hand while getting it from the oven, it was worth it!! So, so yummy. This was fantastic! We had stopped making the Cooks Illustrated baked ziti because it was tasty but was just sort of blank food. I don’t know a better way to describe it. Anyway, we thought we’d try this, and this is our new official baked ziti recipe! I think I’d increase the spinach (because I like spinach) and use all hot Italian sausage. We are definitely making this again! I made this a few nights ago – so very good! Thank you for reminding me that there’s no reason to use sauce from a jar! Hi there, love your recipes. Looked through the comments, and tried googling – can you clarify what you mean by a pound of pasta? I’m guessing you mean pre-cooked, so do you mean a 16 oz box of pasta? Thank you so much!!! Gigi1717 — I don’t know where you live, but in the US, pasta comes in 16-ounce/1-pound packages. You’re going to need a full package, dried. THEN you cook it. Made this for my family. Home run. They loved it! Thanks so much for posting this! It was ridiculously easy to make and, hands-down, the absolute best ziti my family’s ever eaten. Deb’s ziti for the win! Made this tonight and it was wonderful! I baked the whole thing right in my skillet and used Daiya (vegan) mozzarella on top because I’m lactose intolerant. Will definitely be making this again! I made this tonight for company. Out of 8 people, it included two 4 year olds and two 1 year olds. It went down without a single complaint, which is an achievement with that crowd. Thank you! Up until a week ago I was not a fan of baked ricotta, especially within lasagna, almost any place I got it. I mean, it is grainy and liquid-ey and the sauce and the flavors…bleh. But on a fluke last week, while traveling to Harrisburg, PA, I tried a veggie lasagna with ricotta…and…it..was…amazing. The ricotta soared like it was meant to, creamy, slightly sweet, warm…ahh. And I think I know how they did it (in case you want to attempt)…fresh noodles pre-cooked, pre-cooked veggies, pre-made sauce, single serving plate, and baked only long enough to heat through and melt the cheese on top. BTW- I second the homemade ricotta comment though using lemon juice (provided you have a babysitter or a young sous chef at hand). Made this tonight for our neighborhood Trunk or Treat. Followed the recipe but added the 5th link from the Costco sausage pack and all of the pound of mozzarella. Half Romano, in the middle, half Parmesan on top. A healthy, maybe full teaspoon, of red pepper flakes. A hit! People wiped it out and demanded the recipe. I could not ask for more from a recipe than that! Thank you. It was delicious. Just took it out of the oven and it looks fantastic! I had to add can of tomato paste to get “gravy”. All I had was ground beef, chopped tomatoes and juice and it didn’t look anything like yours. Turned out just right. I didn’t have mozzarella, so I used Provolone slices…like the flavor of it better anyway. Can’t wait to eat!! Judy — I can’t be sure, but I’d blame the diced (if that’s what you used) tomatoes. I find they really don’t disperse well into sauces; when someone has used them in a recipe, even many hours of simmering later, I always see tomato cubes. I also love homemade ricotta! So much better than out of a container. Make your own Farmer’s cheese,too. Just drain cottage cheese in a cheesecloth lined strainer in the fridge overnight. I like it better than ricotta in lasagna and stuffed shells….has more flavor. I made this meatless by crushing the tomatoes and cooking almost a pound of fresh spinach. I used a pinch of nutmeg, I just added the spinach to the sauteed onion and garlic. Our local co-op gas goat cheese mozzarella, that made this truly awesome in my book! I didn’t read your note about mushrooms until after dinner! How does comment #120 from Cecilia get published? Absolute perfection! I skipped the meat and added about 8-10 ounces of mushrooms instead. I love all the different textures – crunchy and chewy on top, gooey and softer underneath. I think I’ll try to convince my parents that THIS is what we need to eat on Christmas Eve this year. I made this last week as-is, with the exception of rounding up to 5 oz of spinach instead of 4, and this instantly became our new go-to baked ziti recipe. I used hot Italian bulk sausage and already-crushed tomatoes (because I’m lazy). I wouldn’t change a thing! The spinach makes it seem a smidge healthy, and ricotta on the side instead of baked in makes SO much sense — why isn’t that the norm? Thank you for sharing this awesome recipe! This was delicious and so easy, thanks! Used half ground beef and half sweet Italian sausage, plus about 4 leaves of chard minced up into confetti. Big hit in our house! Also thanks to the commenter who mentioned TJ’s ricotta – I hadn’t tried it before and it was great. I just made this for my family and my uncle’s family who is camped out at the hospital (my uncle is undergoing open heart surgery). And it was just the perfect thing to bring. I changed a few things – I substituted turkey for beef, and used ziti pasta made partly from tomato. Thanks so much for sharing this delicious recipe! We made this tonight and it was amazing. Just the right amount of cheese to make it rich but not overly fatty, tomato sauce was just dry enough to adhere well to the noodles. The noodle and cheese got crispy. So good! This was really good. It is a great suggestion to keep the ricotta out of the dish. In other recipes they put it in, but the ziti bakes up too dry and the ricotta takes up too much of the moisture. Just small scoop on the side was perfect. Love this ziti! It’s my go-to! What’s the staub pan you make the sauce in? Thank you! All I can say is Yum Yum Yum! Have made this several times, using hot Italian sausage, and it is excellent! My go to recipe for a gathering! Thank you! I love this recipe and want to give it to a friend as a freezer meal. How long should she defrost it in the fridge before baking? What kind of ground beef do you use? Think 90/10 is too lean? Thanks! That should be fine. I’ll use fattier for burgers but it’s not a big deal here, buried in sauce. Just made this tonight and YUM YUM YUM!! Followed the recipe exactly and my family scraped the pan clean. Goodbye to my old recipe…way too many ingredients and pots and pans involved. This was clean and easy with minimal and uncomplicated ingredients that can individually shine through, while still coming together as an incredible dinner!! I made this with ground beef, and it was perfect. It’s definitely indulgent, though the spinach in it made me feel less guilty about all the glorious cheese. My boyfriend loved it! Can you put this in the frozen directly from the freezer? If so, at what temp and how long should it bake? I forgot to defrost! Oops! If something is frozen solid, I try to give it a long time in the oven covered at a lower temperate, maybe 300. You want it to warm, not bake again. Once defrosted and warmed through, you can crank it up to get more texture on the lid. It will go much faster if you cut the frozen casserole in thirds or quarters and put them in a larger dish with space between them, so it takes less time for the heat to reach the center. You can dollop it throughout the mixture. Should I use hard mozz or soft (like the ball?) Does it matter? I use something in-between, i.e. not as firm as a block of Poll-O but not fresh either. I almost never use a water-packed one here. It’s great for slicing fresh in sandwiches or salads but adds, IMHO, unnecessary water to recipes where it’s baked. Absolutely perfect. So simple to put together, so delicious to eat. The spinach makes me feel a bit less guilty about all the cheese, especially since a dollop of ricotta is the perfect accompaniment for this crowdpleaser. I’ve made this several times and it’s the first thing I turned to for post-election comfort food. The house is a mess, we all have colds, but friends are coming over and I want to feed them well. This is perfect. Thank you! Made this tonight, using mushrooms instead of meat and a few extra ounces of spinach. We’ve needed comfort food in our house this week and this was perfect – simple and delicious. And next time multiple deadlines, scary-crazy world events, and a sick and cranky baby converge, I’ll be very glad that half the batch is in our freezer. Deb, you’re so going to judge me, but… I make this vegetarian, and I actually make it with *gasp* tofu. Freezing a block of tofu in the container with its water and then defrosting it turns it into a sponge that, when crumbled, is almost exactly the texture of cooked ground meat. You wouldn’t want to make a hamburger out of it, but I heavily season it with what I think of as ‘sausage seasonings’ (fennel, sage, some rosemary, etc) and brown it in olive oil and it works splendidly. I’ve served this to non-vegetarians as well, and no one has guessed that it’s tofu, so it must be working! My family of four likes this so much that I double it and freeze in dinner-sized portions for the best freezer stash ever. Your recipes are great; they all work and make food that we want to eat. Rock on Deb Perlman, rock on. If using mushrooms instead of meat, how/when do you cook those? Do you saute them the same way that the instructions say to saute the meat? Thank you! This is one of my favorite go-to recipes. I usually mix in some shredded mild Cheddar with the mozzarella. I think it gives it a little something extra. And I ALWAYS put it under the broiler for a minute or two. Oh yum!!!!!!! Hi Deb! How long do you think this would take to defrost in the fridge? I usually leave it for a day to be safest. I made this last night for some friends. It was totally delicious- everyone loved it. I used a combo of mild and hot Italian sausage, which was great. The ricotta on the side gives it decadence without overwhelming richness. Definitely a keeper!! Your ziti looks delicious. I found my go to ziti recipe which ends up being that dish that goes to new parents, newly grieving, or just to someone who needs a dish. Interestingly enough, this recipe uses sour cream and provolone for layering. I love ricotta cheese, but many do not. Thank you for sharing your version which looks amazing. Bonus: feeds a crowd and freezer safe! I’ve died and gone to baked ziti heaven! Did this in a big old cast iron skillet which enabled a little extra crunch on the rigatoni noodles. Dolloped ricotta on top before sliding into oven….so amazing! My husband and pregnant belly thank you, Deb! I’ve made this recipe twice and I LOVE IT. It’s easy to make and this is coming from a person who can’t cook. It’s delicious and makes good leftovers for lunch. As if these weren’t good enough reasons, it involves two pots and if you clean the pasta pot as you bake, the kitchen is clean before you eat. I made this yesterday for a concert/picnic evening event at Bloedel Reserve here on Bainbridge Island. A big hit for the crew. Sort of the perfect Italian comfort food. I used Italian chicken sausage and mushrooms and cooked it in a 4″ deep casserole dish that has a lid (for easy transport and dramatic presentation effect with lid removal process). Lovely and a few but not many leftovers for today. Hi -I just made this with mushrooms (tasted amazing). I measured out half the recipe because that was all that I needed and I think the proportions were alright. The only thing is my ziti was falling apart during serving, any suggestions as to what I could do differently (used part skim mozzarella)? Probably more cheese would help adhere it. I made this for my family tonight, and my two and four year old both declared that it was the “best dinner ever!” I don’t think they have ever said that before, so they truly loved it! All of your recipes are winners, but this one was especially wonderful! I made this for dinner with my brother and sister-in-law at the tail end of a long, miserable Minnesota winter. We barely spoke as we ate but grunted loud yummy sounds! Really delicious and simple to make. I will definitely make this again! Oh my goodness … we are about to sit down to this right now. I “sampled” it as I was dishing it out. So good! How many people would you say this serves please?? This recipe has been so helpful for us — just a straight-up basic and simple BUT DELICIOUS freezer staple. We have been trying to simplify our eating without sacrificing flavour and now as part of that effort my husband periodically makes a quadruple batch of these and puts them in foil containers so we have lots in the freezer to pull out when we need them. We keep them cheap by using half ground beef and half delicious local sausage. Everyone in my family loves this recipe, including all three of my kids with their disparate tastes, so it’s a pleasure to have them in the freezer for busy days! Thanks Deb. I have made this ziti a million (probably about 7) times, and I love it. I make it in large part because it freezes (and, more importantly, reheats) so well. I freeze it in lunch-sized chunks, then microwave it to thaw when things get away from me and there’s nothing in the fridge for lunch. 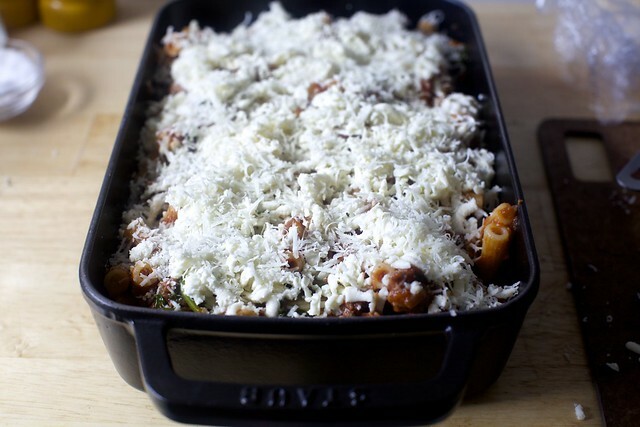 Thanks for the list of freezer-friendly recipes, and thanks for making ziti delicious again! This was really good! The kids loved! Thank you for sharing. Another SK recipe to add to my list! This is delicious! One of my favorite SK recipes! I’ve made it numerous times and it’s always a hit and it’s surprisingly easy! I have never before heard of ziti here in the UK. Is it an americanised version of some authentic italian dish, or . . . . . . . .? What is its history? I make my own ricotta with whole milk and buttermilk. It is ridiculously easy! I made this recipe last night, exactly as written except no spinach, and with Italian sausage. Divided it into 3 dishes, one for us, one for a sick friend, and one for a neighbor. Baked in oval dish as suggested. It was the best ziti casserole I’ve ever tasted, and the crusty parts were addictive. I now regret making 3 dishes as I should have kept it all. I will definitely be making it again, as part of the rotation. I swapped: chickpea pasta for regular pasta (I know, I know…), 90% lean ground beef for sausage, and 2% mozzarella for the full fat stuff. I also skipped the parmesan and added a ton of extra kale. And despite all of my vaguely-healthy changes, this recipe was still super delicious! Deb, your “my old-school baked ziti” was a hit! I followed the recipe exactly and it was simple, delicious, perfectly crispy edged & rustic goodness. I baked it in a 9×13 Pyrex and fed 3 moms and our 3 teenagers with leftovers (I think they were just being polite because we definitely could’ve polished it off). Reheated leftovers for a dinner for 3 tonight. Was pressed by my people to “please make it again!!”. Serving it hot with cold & creamy dollops of ricotta is definitely the way to go! Following comments, I used 90/10 ground beef, fresh homemade mozzarella (that i drained of any water) and a grated mix of Parm & Pecorino. I’ve made this twice since you posted it, and it’s been a major hit both times. One thing I like about it is the flexibility of dividing the pasta between a vegetarian (just cheese) and non-vegetarian (with browned Italian sausage crumbled into it). Should there be leftovers? They are divine. My son is hom from uni fir Easter break. This place s his request (and monkey break)! Thank you Deb for providing me with something that entices the child home! This has become a winter staple for us. I use ground pork with seasonings from the New York Times fennel sausage recipe (1.5 tsp fennel seeds ground up with 2 tsp salt + red pepper flakes) and add a touch of white wine and a bay leaf to the sauce. I favor a more aggressive spinach presence, so I skip the spinach leaves in the actual recipe and sautee a larger portion with garlic as a side. I made this and it was great! One question—if I wanted to take it to someone could I assemble it and give it to them to put in the oven? (Assuming it might be in the fridge for a bit?) same time/temp? Also (okay, two questions!) if I did the whole thing ahead of time what would be the best reheat temp? Dumb questions but thank you so much! Yes you can assemble and bake later. I usually reheat at 350 for 20 or 30, whatever it needs. A big hit – happy fam! Made with hot Italian sausage, added thyme, extra garlic and spinach. Devoured and will be made again. Appreciate the yummy recipe and clear instructions. I used Gigli pasta to give even more crispy edges – worked a treat! I took this as a starting point and went in a different direction, which is why I didn’t check “I made this”. I wanted to use up half a jar of homemade pesto, so instead of a tomato sauce it was a pesto, and I added chopped fresh garden tomatoes at the last minute before going in the oven for a pop of flavor and color. I also added zucchini and eggplant to the saute and omitted the meat to make it vegetarian. I ended up using the 1/2 cup of pasta water since otherwise the pesto didn’t add enough. It came together quick and was awesome! I’ve made this a few times. Last night I subbed cubes of roasted eggplant for the Italian sausage and was very happy with the results & leftovers. Thanks for another simple & wonderful recipe! So I’ve made this several times but still haven’t properly eaten it (I’ve snuck bites of the pre-baked pasta). It’s my go-to for new parents and for family when I know they need a good meal in their freezer. It always gets rave reviews. I make it exactly as written with one very small change – I have Celiac disease so I use gluten free pasta. This is so quick and easy and such a crowd pleaser. SO GOOD! I had this dish on plates in under an hour! So simple yet so delicious and I LOVE the ricotta doled on top, I just wished I had fresh basil. That will be for next time as I definitely will be making again, I’m going to add mushrooms next time! I did use rigatoni as groceries are out of everything being I purchased noodles the day before thanksgiving. I also can’t wait to try with actual ziti noodles, Thank you for another great recipe Deb! I’m thinking of making a mash-up of this, and the baked chicken meatballs, but making the meatballs tiny like in your non-red sauce baked pasta with tiny meatballs recipe, for our Hanukkah/Christmas mash-up celebration. Question – do the meatballs need to be fully cooked prior to being added to the pasta/sauce/cheese to be baked? And if so, would I follow the baked chicken meatballs recipe, cooking a shorter time for tiny meatballs? Or Should I follow the tiny meatball recipe – rolling in flour, stovetop cooking, rather than baking sans flour? I’m worried about drying them out too much by following the tiny meatballs recipe, but concerned if I just bake then mix in, they will fall apart. Thoughts? Thanks! This is one of our winter favorites—I’ve yet to freeze it because there is never any left! Super easy to make, with lots of payoff relative to the effort put in. My all-time favorite SK recipe. I make a hybrid of this and a Melissa Clark recipe by cutting down the sausage to ~250 g (and use hot Italian sausage for more flavour), and then adding 3/4 cup of French lentils and 2 cups of water with the tomatoes. The sauce cooks for longer (~40 minutes) until the lentils are tender, and then I add the spinach and proceed with the Smitten Kitchen recipe. One of my favorites! Last night I made this again for a group of 10– doubled it to be on the safe side, and now I’m glad I did, because there were only 2 servings left! I added a splash of pinot noir to the sauce and really liked the richness it added. Guests showed up early so I ran out of time to make ricotta for the top (plus making cheese in front of your guests can be a little off-putting, lol) but it was delicious nonetheless. Served with your perfect garlic bread and mixed greens in a lemon shallot dressing. Huge hit! thanks Deb as always.